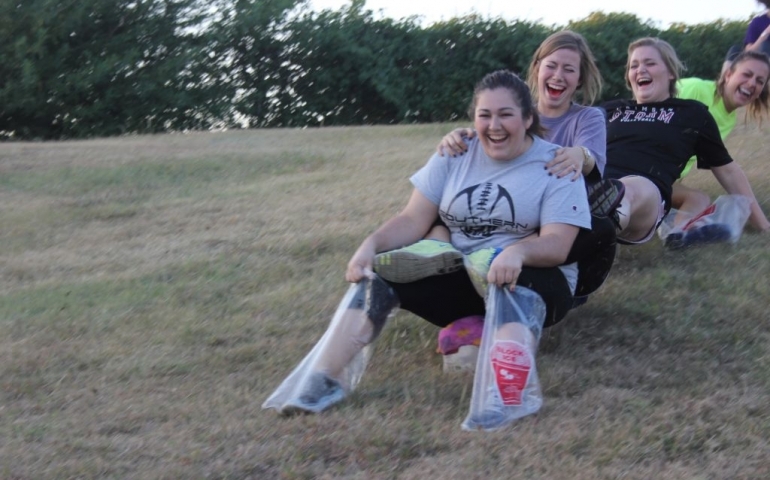 Sunday, September 27th, at 7:30pm the annual SGA ice blocking event returns to Will Rogers Park. In addition to a sense of adventure, you will need to bring a towel, crimson card (if you have one) and your student ID to this free event. This year’s theme is “Ice Blocking en Couleurs Oui, we like ice blocking.” In keeping with the theme, unique to this year’s event, participants will be covered with color while descending the hill, much like what takes place in a color run. So, plan for a layer of color on top of the normal layer of mud. SGA will also be providing a french fry bar for all attendees. Ice blocking is a community event in that it is not limited to just you going down the hill on a block of ice by yourself. In addition to side by side races, making “trains” of ice blocks is common. These trains consist of multiple people lined up on multiple blocks attempting to go down the hill together. Even if you don’t know anyone at the beginning of the event, chances are high that by the end of the event you will have forged new contacts and friendships. Sophomore Quinten Foster witnessed this first hand at his first ice blocking event last year. As for the talk of bumps, bruises and scrapes, those that have participated will confirm that there is a good possibility that you will get banged up in this physical activity. Bumps and bruises can come from running into other people, or more commonly your block of ice stopping and you continuing to slide down the hill. Because of this, ice blocking also makes for a great spectator sport. If you’re looking for a unique activity that only comes around once a year, ice blocking is for you. The event takes place at Will Rogers Park on the east side of I-44. For further directions you can visit and click on the ice blocking poster for a detailed map of the event’s location.